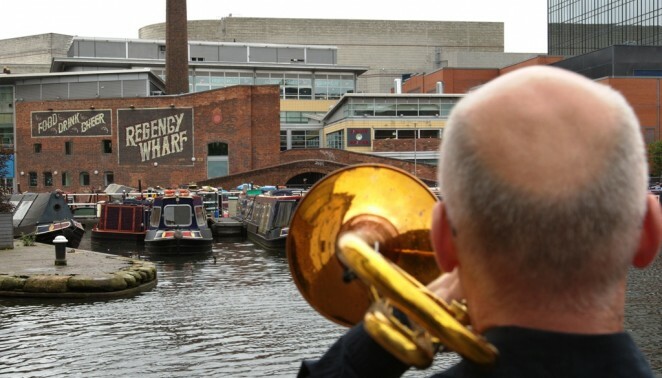 Commissioned by BCMG, Canal Serenade is a celebration of Birmingham canals, with music travelling on the water by narrow boats to the point in Birmingham City Centre where the Main Line, the Fazeley and the Worcester Canals merge. It’s a serenade for a City that was built on investing in the new, with a proud tradition of bold and free-thinking, invention and making things happen. Canal Serenade is a free outdoor performance – an exchange of musical ideas on a stretch of water where goods were once exchanged – with a single work jointly written by UK composer Richard Baker, Cypriot Yannis Kyriakides and Czech Ondřej Adámek, for an array of instruments including trombone, accordion and percussion, voices and electronics. The compositions will be performed on three separate narrowboats, uniting at the meeting point of three canals, with Ex Cathedra lending its voices from the towpath. We are delighted to join BCMG as it celebrates its 30th anniversary season. Richard Baker and Ondřej Adámek’s new works have been commissioned as part of BCMG Sound Investment, with Yannis Kyriakides’s work commissioned by Gaudeamus.